WORCESTER, Mass. /Massachusetts Newswire/ — The dog days of summer bring more than just sultry heat to animal shelters. As the temperatures rise, so does the need for supplies to keep sheltered dogs happy and healthy during the summer months. With the growing number of homeless dogs and puppies, these supplies are vital for improving these dogs’ quality of life. Each July, the Worcester Animal Rescue League hosts the Bow Wow Luau, a “supply raiser” to restock their pantry with items their sheltered dogs need. 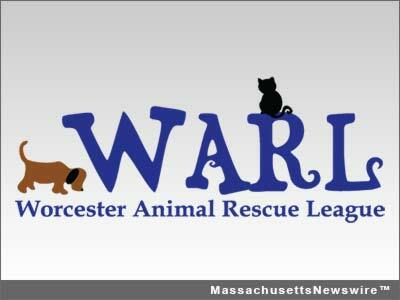 This year, event will be held on Saturday, July 26, 2014, from 12 p.m. to 2 p.m., at the Worcester Animal Rescue League on 139 Holden Street in Worcester. WARL’s Bow Wow Luau is a tropical-themed event where attendees and their canine companions can have some fun in the sun while helping the shelter restock their supply pantry. Dressing in theme is encouraged! Guest will also be able to enjoy treats from the Wooberry frozen yogurt truck on site during the event. Donations are highly encouraged, and the most needed items include martingale collars, toys, other dog supplies, and of course, homes! If you cannot attend the event but would still like to make a donation, either contact WARL regarding your supply donation, or make a monetary donation on their website at: worcesterarl.org/donate/. Worcester Animal Rescue League is dedicated to the care of animals, as well as educating their human counter-parts. “We’re hoping for a great turnout this year. It is such a fun event that brings much needed assistance to the dogs in our shelter,” explains Executive Director of WARL, Allie Tellie. Supply raising events in the past have been very successful for WARL. For more information on the Bow Wow Luau event, please visit the Worcester Animal Rescue League’s website at www.worcesterarl.org. We hope you will join WARL for this special event to benefit abandoned canines while they await their forever homes. Next articleAsheville National Organization for Women to Hold 'Bitter Pill' Rally in N.C.